Today we have a guest post from Fins, now he forgot to include the cipher so you will have to decode it yourself. Ramsey celebrating victory against the big money team, Man. Utd, that he turned down to join The Arsenal, in his last game for The Arsenal against Utd. I thought I’d sing my praises whilst he is still an Arsenal player. Because he is leaving in the same manner with which he has represented The Arsenal and the values of the club all these years: like a hero. Roy of The Rovers ain’t got nuffink on Rambo. Those ineffable values that no one ever mentions. Which brings me back to Ramsey. Current player of the season, voted during the 2017/18 season when he played in central midfield. FA Cup hero and legend, twice over, when playing from central midfield. Therefore given his history I found the lack of footy chat online (but not in reality) about the best British midfielder not being selected to play in central midfield this season save for during a coach’s predictable season saving manoeuvre (Blackpool doesn’t count!) to be a strange yet acutely intriguing story. Predictable if you’ve been watching the quality on the pitch, which is why i was able to predict the selections we saw for these crucial games in advance during our discussions on the end of season form on Positively Arsenal. But as per the disingenuous comments from the Big Blaggers, a surprising series of selections if you have been avoiding the subject all season long. This article is not a comment on Arsenal fans but a reflection on the online content generated by the Sports Communications (PR) experts(?). You read correctly: Best British Midfielder, and has been for a time. I like to discuss the footy, so if you think Aaron Ramsey is not the best British midfielder of his generation then please tell me: who is? (Sterling is a forward). And why hasn’t the best British midfielder been acknowledged as the best British midfielder? Because he is Welsh? Or because he plays for The Arsenal. I refer you all to Gareth Bale. Thanks! “I blame Venga for everything including not disciplining Ramsey”. Such ignoble drivel ignores his consistent form in midfield in recent years save for a spell coinciding with his adjusting to his role for Wales, playing slightly further up the pitch with less defensive responsibility for his national team on a regular basis. He struggled with the continuous adjusting but not for too long as you all remember when you voted him as your player of the season last season playing from central midfield. I’m sure those who did can remember why. For I am not a cunning linguist. The esteemed Blaggers & selfless podcastateers have avoided discussing what the larger proportion of Arsenal fans have been talking about specifically from mid-season: The starting elevens since the Liverpool Home game onwards. And the pressures on the coach from upstairs. Match day became an exercise in checking the starting eleven an hour before kick off because watching their club force out one of the top talents in the league when there was no need is not what the Arsenal fans were hoping for when buying their season tickets last Summer. When Ramsey wasn’t even starting or playing more frequently whilst Miki was out injured then it wasn’t the position or the football that was the problem that was keeping the highly respected football player off the football pitch. The coach had a misguided preference of where to play Ramsey that he has now corrected. Hopefully for the rest of the season. This is not a critique of the coach, just an observation. He played Mustafi at RB which made me happy, and Mustafi had a decent game there, away at Spurs, until the penalty. Will he start at RB if Unai starts with four at the back for the Home fixtures? I’m happy it’s not my call to make! As you can all recall Liverpool under Klopp targeted the unprotected Ramsey early on in their recent visits, which is why his absence in the home match this season and thereafter became the ongoing topic for people that like to discuss the footy. The evaporating credibility of the blaggers may have been avoiding the subject but the opposing managers were paying attention! There is enough evidence to support the appreciation that the Arsenal fans spent the winter wondering what was happening with the fan favourite, a player who is often the opponent’s key concern, the player they voted as player of the season just last year. Alongside the Ozil story, which alas is more then just a story about the worst year of injuries in Ozil’s career. A story linked to Ramsey’s. But this topic wasn’t on the 24/7 menu over the Winter. Which is remarkable and therefore I hope no precious souls are offended if I remark upon it. It appears that the selfless blaggers’ briefings didn’t include the footy. Only now in the last week have the self appointed voices of the fans dared to question Raul Sanllehi after the most recent debacle in the news. For The Arsenal football club fans our concerns have been related to the football and the impact that this management consultant has had on the football pitch over the course of the season. From these un-credible sources we’ve also been treated to the nonsense that the player who just won the MOTD and Adrian Clarke MOTM award playing in midfield against the in form Utd has had to adapt to playing in midfield this year under the new coach. Which is why he hasn’t been selected in midfield. The position from which he was voted the fans player of the season last year! And from where he scored two FA Cup winning goals in the two greatest FA Cup triumphs of the most successful club in the history of the cup. Disingenuous tripe proffered in order to explain this belated second coming which normal everyday fans like you or me could predict as the season came to a crunch. The Arsenal fans deserve better! It was possible during the discussions on the arsenal’s end of season prospects over the last few months on PA for me to speculate that the coach would return his best players to his starting eleven for the recent key fixtures, and that there’d be less rotation around the Utd game. It was possible to predict as he had to win these games to try and salvage his season and therefore it meant that he would be ignoring any pressures from elsewhere. Early on against Rennes in the recent game we saw a classic Ramsey move. First he releases Lacazette with a long pass over the top, as the Arsenal win back possession from a panicked clearance quick play and movement from his teammates finds him space to feed an attack which he himself then follows up at the byline with magical feet to find the amazing Aubameyang. With Ramsey’s legs starting to go after playing all the games over the last two weeks late on against rennes he simply stood still yet still created the move in partnership with Miki, who feeds Kolasinac who crosses for Aubameyang to score the winning goal. And that’s how an all round attacking box to box midfielder plays, like a midfielder. It’s not hard to see what Sven’s plan was with all of his signings combining with the key figure to knit the squads style and identity together. Giles Grimaldi’s freshly severed head was recently stuck upon Raul’s resplendent trident now hoisted above Highbury House, joining Sven’s rotting yet still smiling face (Leno also earning the plaudits alongside his other signings as described above), next to the still gagged stump that used to be known as Ivan. Staggeringly those who spent so long attacking the identity of the club previously for years and years and years have been schtum. No billboard adverts etc. Sports Communications eh? Only this week have they dared to question the people failing to hide in the shadows who are now running the club. After Monchi, dropped his load, his suitcase at the airport, and ran as fast as he could in the other direction. It is no wonder that Sven’s decomposing face retains that smirk. The rebuilt team from the last two years is essentially Sven’s team which makes the forcing out of the two key players knitting the former great cup winning squad with the emerging squad an act that football fans won’t appreciate. By their silence the online Arsenal Billy Big Blaggers have given their sanction to further churn to come in the playing squad next season and the drop off in quality that will occur when Rambo goes. It will take some years for a home grown player to ever attain a similar status. If we are lucky. And Sven’s players don’t come wrapped with the same blubber beloved of Jabba Sanllehi. Neymar. Paulinho. Etc. It’s been a fascinating account left on the record for all to see this past twelve to eighteen months of the divergence between the content from those who make money talking around the football 24/7, and the actual football that we’ve been watching on the football pitch. You all remember how all the blaggers expressed their embarrassing confirmation bias in the summer that Emery was going to be a gegenpressing fiend (which Klopp is not in the PL, as no team can do that in the PL…), even though the football on the pitch during pre-season was showing us something completely different. I haven’t even mentioned Bellerin’s take down of AFTV Media. I give thanks to the always impressive young man who is far more mature then the previous Barca graduate and who also expresses and admirably upholds those Arsenal values as turkey’s like the Billy Big Blaggers won’t be voting for Xmas anytime soon. Ozil this season is getting the same treatment from the Blaggers that Bellerin got from AFTV Media. Let’s hope Raul doesn’t have Hector in his sights too! This PR driven coverage of the football and the footballer Aaron Ramsey reminds me of those people who blamed last season’s poor defensive form on, and I quote, “poor defensive coaching” and not upon having a one legged Koscielny and my favourite back up RB as the starting CBs. I refer the reader to the 18/19 GA column as objective data, no need to hear my precious opinions. You’re welcome! Fortunately as an Arsenal supporting sports physio informed us during the summer on the Bergkamp Wonderland podcast, Koscielny would come back strong after a break from his chronic injury problems (once he’d gone through his pre-season in December). Probably to return better in form then when playing through all those pain killing injections last season. A great example that not all opinions or content online is rubbish, which therefore also allows us to apply forensic consideration to some of this edited content on events this season, specifically the Ramsey and Ozil stories, the big swerve around Raul’s spike fetish, on how to quantify the content that, for example, omits the career of Mertesacker at the Arsenal whilst telling us that Arsenal haven’t bought any good defenders in the last ten years. If Koscielny hadn’t got injured then both the triple cup winning CB heros would also have won the World Cup during their time at the Arsenal (that is not an opinion!). Fortunately as the stories surrounding some pundits recently helps to highlight: for a fair few their primary job is in the employ of sporting agencies and super agents. Just like Michael Vaughan former England captain, now a Sports Communication rep and pundit in that order. Hardly a controversial consideration. If David Pearce can make a reputation as a fine writer with work such as The Damned United, unlike say your Barnay Ronay’s out there, reflecting upon the role of agents and dodgy wonga in the game, unlike say your Barnay Ronay’s out there, then yes it is entirely reasonable to reflect upon the impact the agents and agencies have upon online media just as they have been shown to do on the BBC/Sky/BT couch or upon the back pages of the discredited rags. -Q: What is the difference between a Takeover and a Handover? In spite of the reams of gibberish that surrounds the sport it is still: a sport. With players like Ramsey, and many others. All of this is to simply say thanks to George and everyone who has been helping him to keep this blog going. Was it really a “great” cup winning team? How can we quantify the squad which won three FA Cups in four years whilst finishing 2nd and 3rd? And how can we appreciate the importance of Ozil and Ramsey to this achievement alongside other key players in the squad and their specific importance at this moment as handover figures after the huge squad rebuild in 2017/18? Here is the list explaining this achievement below. The greatness of the squad just passed is self-explanatory if you refer to the only two squads to have matched this achievement or come close to it. Good tribute on https://www.arsenal.com/ Rocky’s Anniversersary of his passing. Katie McCabe with our goal, a just about deserved win, not at our best but created a few good chances, but had to wait till late on for the winner, brum with a few good chances too. Arsenal Women now back in CL next season, and with 3 games to go are 4pts clear of Man City, so only need 2 wins max to win the title for the first time in 7 years. In fact as we play man city last game of the season a win over city would be enough, a win in either of our other two game and a draw v city will be enough. But lets hope the girls wrap up the title before we play city. liverpool play spurs later and for me its a win win situation, for me who grew up during liverpool’s most dominant period and who knows lots of liverpool fans, many of whom are obnoxious when it come to their support of them, to say the least, I don’t want them winning the title, I don’t want them winning anything, so a spurs win today is ok with me, as it dents lfc’s title chance, a draw would impinge on it too and it would dent spurs top 4 chances, and lfc win would mean spurs poor run of form continues and gives Arsenal a great chance tomorrow to get a lead on them in the battle for 3rd. Incredible to see Giroud who played so effectively no for France in the interlull still out the Chelsea team. Giroud coming on now, fingers crossed Cardiff can hold on! 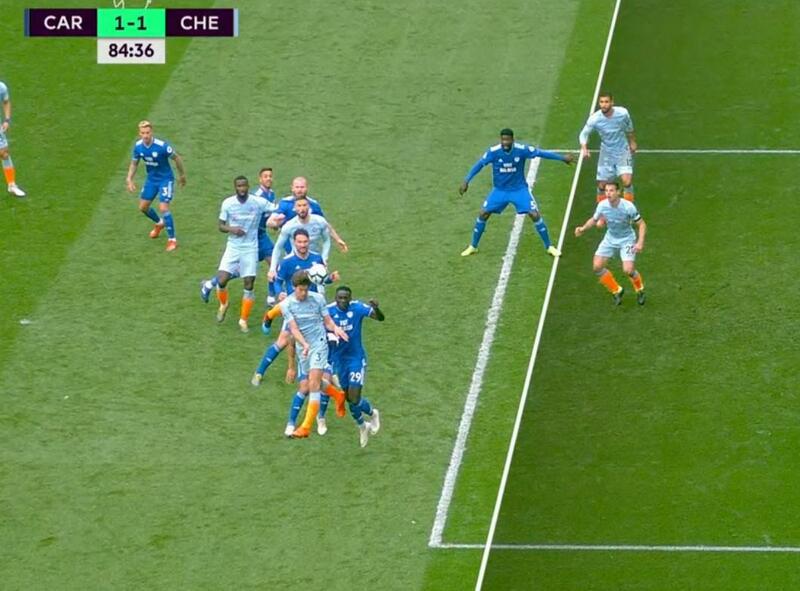 Terrible performance by the officials , Cardiff were robbed. Funny how certain teams benefit so often from this sort of thing, actually, not funny, downright suspicious. Shame both chelski and manure scrapped undeserved wins. Important now we perform well and secure three points to start the run in the right way. With five away games against some very good teams the home games will be must wins. Although were not playing any of the top six, playing all those vying for seventh will be very testing. I still think we have the most difficult run in because all our games seem to be against sides in form whereas the others have the odd hard game and some easy ones. All the sides have more home games than us and under less pressure. It’s going to be very interesting. well we now have the chance to see if things have changed at AFC or not, over recent seasons when presented with the chance to take advantage of a rivals slip up, and move into top 4 we have normally fecked it up, tomorrow we play relegation fighting Newcastle at home, so lets see what if anything has really changed. That pic is scarcely believable Eduardo, it really is. As for Spurs, seems the media are now reduced to begging up their stadium, sometimes at the expense of ours, look fairly similar to me from photos of theirs, theirs looks more like a toilet from above, but seats 400 more, but ours cost less than half of theirs , and is a good way to being paid for. Good read about Aaron, still very much incredible to think he’ll go. This break seemed very long, missed the football! Chelski dodged a bullet thru incompetence once again of the refs, wonder if Warnock will be sanctioned for his postgame comment, best league in the world with the worse refs… soneth8ng we’ve long known. Looking forward to the match tomorrow, our big chance for third! Can’t say I saw that coming 2 months ago but am happy about it. To finish, what a great finish for the éternel bottlers the tiny tots, that ball off the header was like a beach ball, yet they really went for the extra laugh!! they now have 61pts and a goal difference of +19, and are just the 1pt ahead of us, but we have a game in hand. our goal difference has gone from +16 to +24. I think I won’t get to see the game, have an event I have to go to, I’ll be checking my phone for updates. Where is today’s preview of today’s game? Hopefully both senior CMs Xhaka and Ramsey have recovered from their niggles and are good to go. Lucas might still be feeling a little bit jet lag.